NEWTON, N.C. (April 28, 2012) It was an exciting night of racing at Hickory Motor Speedway with two Bojangles Late Model features along with the regular schedule of Paramount KIA Limited Late Models, WrenchRags Street Stocks, Super Trucks and Hobby Stocks. Although the weather was cool, excitement ran high among drivers and fans. Racing kicked off with the first of two features for the Bojangles Late Model Racing Series. The No. 43 of Jesse LeFevers started the night on the pole. By lap 12, the first four cars had broken away from the pack, setting the pace. On lap 15 the No. 14 of Sean Rayhall came down pit road due to motor issues. Only three laps later, the No. 01 of Tyler Lester, brought his car down pit road, by lap 21, the racing for second began to heat up between the No. 12 of Austin McDaniel and Kyle Moon in the No. 19. The Super Trucks were the second event of the evening with their 35 lap feature. The No. 33 of Jeremy Birch brought the field to the green flag. On lap 10 Zach Napoleon in the No. 09 brought out the yellow flag for a spin occurring on the front stretch. The No. 94 of Brad Cox saw the black flag for jumping a restart on lap 20. Birch brought home the victory with the No. 11 of Thomas Beane finishing second. Jason Cochran in the No. 02 rounded out the top three of the evening. Mike Newton in the No. 5 brought the WrenchRags Street Stocks to the green flag. On lap 10, the No. 1 of David Snyder came down pit road due to smoke and leaking oil. Two caution flags flew on lap 15. The first for the No. 33 of Mark Whitten and No. 69 of Trey Buff in turn one. The green flag was followed shortly by a yellow before another lap was completed. Buff spun on the front stretch. With two laps to go, the No. 03 of Kevin Eby began looking to the inside of Newton. Newton was able to hold Eby off for the victory and Eby brought home second. No. 51 of Dustin Walker rounded out the top three. The Paramount KIA Limited Late Models took the green flag next with Zach Bruenger in the No. 55 leading the way. On lap five, the No. 22 of Dan Moore and Sheflon Clay in the No. 15 were involved in an accident coming out of turn four. The caution flag flew for the second time on lap 29 for debris on the back stretch, giving the drivers a chance to group together for a six lap shoot out to the finish. The No. 00 of Shane Lee finished first with Landon Huffman in the No. 75. This finish was a memory of the golden days at Hickory Motor Speedway, their fathers also shared many one-two finishes. Pole sitter Bruenger brought home the third place finish. The Hobby Stocks took to the speedway for their 20 lap feature with Tyler McKinney in the No. 47 leading the way. One caution flag flew on lap seven for a spin in turn two. Tyler McKinney brought home the victory with Chad McKinney in the No. 95 finishing second. Third was Paul Wyatt in the No. 84. The final event of the evening was the second feature for the Bojangles Late Model Series. For the second installments, Keith Bumgarner in the No. 97 led the field to the green flag. Before the first lap was completed the yellow flag flew for an accident in turn two, involving the No. 4 of Mackena Bell. At the halfway point Bumgarner was in the lead with the top six following behind single file. On lap 42, the caution flew again for an accident in turn four. This caution flag provided the field the opportunity to group together and race to the finish. The No. 2 of Gibson began to challenge Bumgarner for the lead, racing him on the inside through each turn. At lap 47, Gibson managed to take the lead and bring home the victory. Bumgarner finished second and LeFevers, winner of the first feature rounded out the top three. On May 5 the NASCAR Whelen All-American Series will take to the track. That nights' races will include the Bojangles Late Models, Paramount KIA Limited Late Models, WrenchRags Street Stocks, 4-Cylinders, Red Baron Renegades and Mini-Cup. Gates will open at 5:00 p.m. with qualifying immediately following. 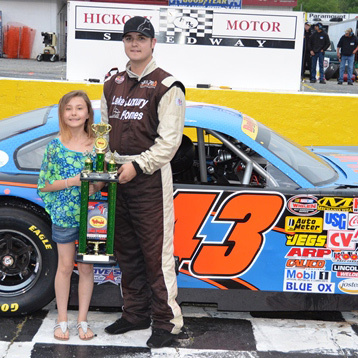 An On-Track Autograph Session begins at 6 p.m., with feature racing action at 7 p.m. For more details visit www.hickorymotorspeedway.com.